Birmingham New Street is the largest and busiest of the three main railway stations in the city centre of Birmingham, England. It is a central hub of the British railway system. It is a major destination for Virgin Trains services from London Euston, Glasgow Central and Edinburgh Waverley via the West Coast Main Line, and the national hub of the CrossCountry network – the most extensive in Britain, with long-distance trains serving destinations from Aberdeen to Penzance. It is also a major hub for local and suburban services within the West Midlands, including those on the Cross City Line between Lichfield Trent Valley and Redditch and the Chase Line to Walsall and Rugeley Trent Valley. The station is named after New Street, which runs parallel to the station, although the station has never had a direct entrance to New Street except via the Shopping Centre. Historically the main entrance to the station was on Stephenson Street, just off New Street. Today the station has entrances on Stephenson Street, Smallbrook Queensway, Hill Street and Navigation Street. New Street is the eighth busiest railway station in the UK and the busiest outside London, with 35.3 million passenger entries and exits between April 2014 and March 2015. It is also the busiest interchange station outside London, with over 5.4 million passengers changing trains at the station annually. The original New Street station opened in 1854. 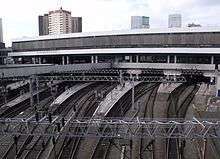 At the time of its construction, the station had the largest single-span arched roof in the world, In the 1960s, the station was completely rebuilt. An enclosed station, with buildings over most of its span and passenger numbers more than twice those it was designed for, the replacement was not popular with its users, having a customer satisfaction rate of only 52% - the joint lowest of any Network Rail major station. A £550m redevelopment of the station named Gateway Plus opened in September 2015. It includes a new concourse, a new exterior facade, and a new entrance on Stephenson Street. Around 80% of train services to Birmingham go through New Street. The other major city-centre stations in Birmingham are Birmingham Moor Street and Birmingham Snow Hill. On the outskirts, closer to Solihull, is Birmingham International, which serves Birmingham Airport and the National Exhibition Centre. Since 30 May 2016, New Street has been served by the Midland Metro tram line, when it became the new terminus of Line 1, following the opening of the city-centre extension from Birmingham Snow Hill. The Grand Central New Street Station tram stop is located outside the station's main entrance on Stephenson Street. The station is allocated the IATA location identifier QQN. The original New Street station was built by the London and North Western Railway (LNWR) between 1846 and 1854. It was built so that a large through station could serve the centre of Birmingham, replacing several earlier rail termini on the outskirts of the centre, most notably Curzon Street, which had opened in 1838, and was no longer adequate for the level of traffic. For the first 31 years, the LNWR shared the station with the Midland Railway, whose trains also used the station. However, in 1885 the Midland Railway opened its own extension alongside the original station for the exclusive use of its trains, effectively creating two stations side-by-side. The two companies stations were separated by a central roadway; Queens Drive. Traffic grew steadily, and by 1900 New Street had become extremely busy, with an average of 40 trains an hour departing and arriving, rising to 53 trains in the peak hours. The London and North Western Railway had obtained an Act of Parliament in 1846, to extend their line into the centre of Birmingham, which involved the acquisition of some 1.2 hectares (3 acres) of land, and the demolition of 70 or so houses in Peck Lane, The Froggery, Queen Street, and Colmore Street. The Countess of Huntingdon's Connexion chapel, on the corner of Peck Lane and Dudley Street, which had only been built six years before, was also demolished. The station was formally opened on 1 June 1854, although the uncompleted station had already been in use for two years as a terminus for trains from the Stour Valley Line, which entered the station from the Wolverhampton direction. On the formal opening day, the LNWR's Curzon Street railway station was closed to regular passenger services, and trains from the London direction started using New Street. The station was constructed by Messrs. Fox, Henderson & Co. and designed by Edward Alfred Cowper of that firm, who had previously worked on the design of The Crystal Palace. When completed, it had the largest arched single-span iron and glass roof in the world, spanning a width of 212 feet (65 m) and being 840 ft (256 m) long. It held this title for 14 years until St Pancras station opened in 1868. When first opened, New Street was described as the "Grand Central Station at Birmingham". Midland Railway trains that had used Curzon Street began to use New Street from 1854. However, its use by the Midland Railway was limited by the fact that those trains going between Derby and Bristol would have to reverse, so many trains bypassed New Street and ran through Camp Hill. This was remedied in 1885 by the extension into New Street of the Birmingham West Suburban Railway. This allowed through trains to the south-west to run through New Street without reversing. To cope with the increase in traffic this would bring, the station required an extension. 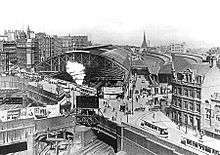 In conjunction with the new link, construction work on the extension began in 1881, it was opened on 8 February 1885. A number of buildings, mostly along Dudley Street were demolished to make room for the extension, including a number of cottages, some business premises and a small church. Built to the south of the original station, the extension contained four through platforms and one bay. 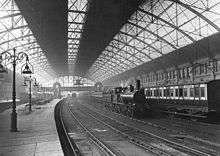 It consisted of a trainshed with a glass and steel roof comprising two trussed arches, 58 ft (18 m) wide by 620 ft (189 m) long, and 67 ft 6 in (21 m) wide by 600 ft (183 m) long. It was designed by F. Stevenson, Chief Engineer to the LNWR. Initially the extension was used by both the LNWR and Midland Railway, but from 1889, it became used exclusively by Midland Railway trains, It was separated from the original LNWR trainshed by Queens Drive, which became a central carriageway, but the two were linked by a footbridge which ran over Queens Drive, and across the entire width of both the LNWR and Midland stations. Queens Drive was lost in the rebuilding of the 1960s, but the name was later carried carried by a new driveway which served the car park and a tower block, and is the access route for the station's taxis. The station was completely rebuilt in the 1960s as part of the West Coast Main Line modernisation programme. In 1964, demolition of the original New Street station and Queen's Hotel began and was not completed until 1966. The rebuilt New Street station was opened on 6 March 1967 to coincide with the introduction of electric expresses on the West Coast Main Line. It cost £4.5 million to build in 1967 prices, (approximately £74 million in 2015 prices) The 1960s station was redeveloped in 2010-15. The rebuilt station was designed by Kenneth J. Davies, lead planner for the London Midland Region at British Rail. The concrete constructed design was widely criticised for being ugly. The station was built with 12 through platforms, replacing the eight through and six bay platforms of the previous station. The platforms are covered over by a seven-acre (2.8 ha) concrete deck, which is supported by 200 columns; the concourse and other buildings are built above the platforms upon the deck. Escalators, stairs and lifts are provided to reach the platforms from the concourse. The new station had sold its air rights, leading to the construction of the Pallasades Shopping Centre (then known as the Birmingham Shopping Centre) above the station between 1968 and 1970. The station and the Pallasades are now partly integrated with the Bullring Shopping Centre via elevated walkways above Smallbrook Queensway. Approach tracks, platforms and exterior of 1960s New Street from the east. Also above the station is a nine-storey office block called Ladywood House, and a multi-storey car park dating from the 1970s. The car park closed in May 2012 and was demolished to provide space for the new concourse and rebuilt. Stephenson Tower, a 20-storey residential tower block, was built alongside the station between 1965 and 1966. The tower, designed by the City Architect of Birmingham, was demolished in March 2012 as part of the station redevelopment. 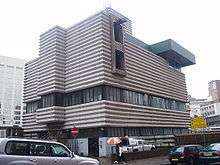 The power signal box at New Street was completed in 1964. The signal box is a brutalist building with corrugated concrete architecture, designed by Bicknell & Hamilton in collaboration with W. R. Healey, the regional architect for British Railways London Midland Region. The four-storey structure is at the side of the tracks connected to Navigation Street. It is now a Grade II-listed building. The eastern entrance to the station, following redevelopment. Furthermore, the 1960s station became increasingly inadequate to cope with the passenger numbers, which rose to a far higher number than it was designed to handle. New Street was designed to cater for 650 trains and 60,000 passengers per day. In 2008 it catered for 1,350 trains and over 120,000 passengers per day. This increased further to 140,000 by 2013. This made overcrowding and closures on safety grounds more common. A feasibility study into the redevelopment of the station was approved in January 2005. A regeneration scheme was launched in 2006. Since then, the scheme has taken various forms, and various names, such as Birmingham Gateway, Gateway Plus, and New Street Gateway. This proposed complete rebuilding of the street-level buildings and refurbishment of the platforms, with track and platform level remaining essentially unchanged. A target date given for completion was 2013. In February 2008, the then Secretary of State for Transport, Ruth Kelly, announced that the Department for Transport would provide £160 million on top of the £128 million that is to be provided through the government White Paper Delivering a Sustainable Railway. A further £100 million would be provided by the Department for Business Enterprise and Regulatory Reform and channelled through Advantage West Midlands, the regional development agency. The announcement brought total government spending on the project to £388 million. After earlier proposals were discarded, six architects were shortlisted to design the new station following a call for submissions, and it was announced in September 2008 that the design by Foreign Office Architects had been chosen. The fact that the Gateway development leaves the railway capacity of the station more or less unaltered has not escaped attention. In July 2008 the House of Commons Transport Committee criticised the plans: it was not convinced they were adequate for the number of trains which could end up using the station. It said if the station could not be adapted, the government needed to look for alternative solutions. Designs were shown to the public in February 2006 for a new Birmingham New Street Station in a project known as Gateway Plus. The new concourse completed in September 2015. The approved planning application submitted to the council in August 2006 showed a glass façade with rounded edges. The entrance on Station Street originally included two curved 130-metre-tall towers on the site of Stephenson Tower. Due to the economic slowdown, the "twin towers" plan was shelved. The refurbished Pallasades Shopping Centre was renamed 'Grand Central Birmingham' and includes a new John Lewis store. Work began on the redevelopment on 26 April 2010. Construction was completed in phases to minimise disruption. On 28 April 2013, one half of the new concourse was opened to the public, and the old 1960s concourse was closed for redevelopment, along with the old entrances. The complete concourse opened on 20 September 2015, the Grand Central shopping centre opened on the 24th. Trains departing towards Proof House Junction (a end) can depart from any platform, but there are restrictions on trains departing from the b end. All platforms can accommodate trains heading towards Wolverhampton, however due the platform layout and road bridge supports, only 5–12 can accommodate trains heading towards Five Ways. There are a number of sidings on the station for the stabling of trains; between platforms 5/6, 7/8, 9/10. The bay platforms at either end of platform 12 have been removed during the current rebuild. The sidings in front of New Street signal box have also been removed. All signalling is controlled by New Street power signal box at the Wolverhampton or b end of the station; it can be seen at street level on Navigation Street. New Street North Tunnel – also known as Monument Lane Tunnel, heads westwards towards Soho Junction & Wolverhampton. The tunnel passes under the National Indoor Arena. This tunnel is 760 yards (695 metres) long. New Street South Tunnel – 266 yards (243 metres) long, heading eastbound, passing under the Bullring, and Birmingham Moor Street station, heading towards Duddeston, Adderley Park, the Camp Hill Line and the Derby lines towards Tamworth. Gloucester Line Tunnels – are 4 separate tunnels heading south-west towards Five Ways. Heading from New Street in sequence the tunnels are named Holiday Street Tunnel; 93 yards (85 metres) long, Canal Tunnel; 224 yards (204 metres) long, passing under the Birmingham Canal Navigations, Granville Street Tunnel; 81 yards (74 metres) long and Bath Row Tunnel; 209 yards (191 metres) long. Network Rail, as well as operating the station, operated a customer reception located on the main concourse. Booking office and barriers are split between Virgin Trains and London Midland, with customer service or floor walker staff provided by CrossCountry. Virgin Trains operates a first class lounge and Network West Midlands also provides a public transport information point of the station. New Street is a penalty fare zone, which is operated by London Midland on its trains and at the manual ticket barriers at the station. Since privatisation of British Rail there have been no fewer than 9 train companies operating into New Street: Arriva, Central Trains, CrossCountry, London Midland, Silverlink, Virgin Trains, Virgin Trains CrossCountry, Wales & Borders, Wales & West. Currently Arriva Trains Wales, London Midland, Virgin Trains and CrossCountry provide services from New Street. Wrexham & Shropshire used to operate through the station without stopping and Chiltern Railways have on occasion used New Street during engineering works. London Midland operates a traincrew depot at the station and stables some trains overnight around the station. For the most part they use Soho TMD in Smethwick for electric traction units, with its non-electric units kept at Tyseley TMD to the southeast of Birmingham. CrossCountry also operates a traincrew depot at the station; it uses Tyseley TMD for the Class 170 units, and its Voyagers are based at Barton under Needwood depot near Burton on Trent, Staffordshire. 1tph to Newcastle Central via Sheffield and Doncaster. 1tph to Edinburgh Waverley via Leeds and Newcastle Central, continuing alternately to Glasgow Central or Dundee and Aberdeen. New Street station is a few hundred metres away from Birmingham Moor Street; the city's second busiest railway station. There is a signposted route for passengers travelling between New Street and Moor Street stations which involves a short walk through a tunnel under the Bullring shopping centre. Although the railway lines into New Street pass directly underneath Moor Street station, there is no rail connection. In 2013 a new direct walkway was opened between the two stations making interchange easier. Birmingham Snow Hill station is also a ten-minute walk away to the north, or can be reached via a short tram ride on the Midland Metro. On 27 November 1921, a serious accident occurred on the Midland half of New Street station, when an express from Cheltenham and Bristol crashed into the rear of a train to Tamworth, which was standing at platform four and had been delayed due to engine trouble. The collision caused the guards van of the Tamworth train to telescope with the rear coach. Three people were killed, and fourteen injured. The later inquest ruled that the driver of the express had overrun the danger signal, and the misty conditions had made the rails moist, leading to wheelslip when the train tried to brake. On 30 May 2016, the new Midland Metro tram stop serving New Street was opened outside the station's main entrance on Stephenson Street. The stop is the current terminus of the Midland Metro Line One, and provides a link to Snow Hill station and onwards to Wolverhampton. Initially, New Street station was planned to act as the terminus of the Midland Metro extension to Line One through the city centre. However, in October 2013 Birmingham City Council voted to extend the new development works, adding a further two stops beyond New Street, at the Town Hall and Centenary Square. As the two additional stops are due to be completed in 2017, New Street will only serve as the terminus of Line One between 2016 and 2017. 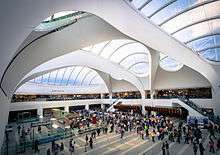 In November 2013 Birmingham City Council indicated a new plan to connect Birmingham New Street with the new High Speed 2 terminus at Curzon Street, Birmingham International Airport and Coventry. 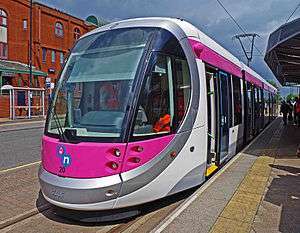 Mondays to Saturdays, Midland Metro services to Wolverhampton St George's run at six to eight-minute intervals during the day, and at fifteen-minute intervals during the evenings and on Sundays. ↑ "Our routes & stations". Virgin Trains. Retrieved 19 May 2013. ↑ "Routes". CrossCountry. Retrieved 19 May 2013. ↑ "Estimates of Station Usage 2011/12" (PDF). Office of Rail Regulation. p. 18. Retrieved 19 May 2013. ↑ "Estimates of Station Usage 2011/12" (PDF). Office of Rail Regulation. p. 19. Retrieved 18 May 2013. 1 2 "Birmingham New Street's 150-year history revealed as station switchover nears" (Press release). Network Rail. 22 April 2013. Retrieved 19 May 2013. 1 2 "Revamped station tops train poll". BBC News. 2 August 2007. Retrieved 20 August 2007. ↑ "Birmingham New Street update January 2013" (PDF). Jewellery Quarter Development Trust. Retrieved 8 February 2013. 1 2 "New Street: New Start - The Birmingham Gateway Project". Birmingham City Council. Retrieved 22 June 2011. 1 2 3 4 5 6 7 "Birmingham New Street — History". Network Rail. Retrieved 6 July 2008. 1 2 Brown, Graeme (30 May 2016). 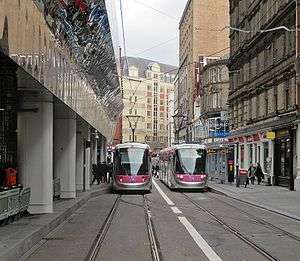 "WATCH: Midland Metro trams head to Birmingham New Street for first time". Birmingham Mail. Retrieved 30 May 2016. 1 2 3 4 5 6 7 8 9 Smith, Donald.J. (1984). New Street Remembered, The Story of Birmingham's New Street Station 1854-1967. Barbryn Press Limited. ISBN 0 906160 05 7. ↑ "www.warwickshirerailways.com - lnwrbns_str1295c". www.warwickshirerailways.com. Retrieved 28 February 2013. ↑ Aris's Birmingham Gazette, 16 February 1850. ↑ It had been opened Tuesday 16 May 1843. Aris's Birmingham Gazette, 20 November 1848. ↑ Aris's Birmingham Gazette, 20 November 1848. ↑ "warwickshirerailways.com - lnwrbns_str1295.htm". warwickshirerailways.com. Retrieved 10 February 2013. ↑ "A Selection of Great Victorian Railway Stations". victorianweb.org. Retrieved 10 February 2013. 1 2 "Birmingham New Street". Network Rail. Retrieved 24 April 2013. ↑ Bradshaw (1863). Bradshaw's Descriptive Railway Hand-book of Great Britain and Ireland. Oxford: Old House. pp. Section III, Page 20. ISBN 9781908402028. ↑ Foster, Andy (2007) . Birmingham. Pevsner Architectural Guides. Yale University Press. p. 110. ISBN 978-0-300-10731-9. 1 2 Christiansen, Rex (1983). A Regional History of the Railways of Great Britain, Volume 7 The West Midlands. David St John Thomas David and Charles. ISBN 0946537 00 3. 1 2 Foster, Andy (2007) . Birmingham. Pevsner Architectural Guides. Yale University Press. p. 216. ISBN 978-0-300-10731-9. ↑ Jeffrey, Ben (24 July 2007). "New look for 'ugly' New Street". BBC News. Retrieved 19 February 2013. ↑ "Aerial View of New Street Station 1963". Birmingham City Council. Archived from the original on 11 May 2008. Retrieved 6 July 2008. ↑ "Prime city centre long leasehold for sale". Ladywood House. 2012. ↑ "Pallasades car park to close for demolition and rebuilding" (Press release). New Street: New Start. 25 April 2012. Retrieved 12 February 2013. ↑ "Report No. 7 – New Street Station, Stephenson Street/Navigation Street/Station Street and Smallbrook Queensway, City (C/05066/06/OUT) minutes" (PDF). Birmingham City Council. Retrieved 6 July 2008. ↑ Gibbons, Brett (30 March 2012). "Stephenson Tower finally disappears from Birmingham city centre skyline". Birmingham Post. ↑ "Iron Horse". Public Monuments and Sculpture Association. Retrieved 18 March 2015. ↑ "Kevin Atherton". LUX. Retrieved 18 March 2015. ↑ Noszlopy, George T.; Beach, Jeremy (1998). Public Sculpture of Birmingham including Sutton Coldfield. Liverpool University Press. ISBN 0-85323-692-5. ↑ Foster, Andy (2007) . Birmingham. Pevsner Architectural Guides. Yale University Press. p. 207. ISBN 978-0-300-10731-9. ↑ Historic England. "Grade II signal box (442131)". Images of England. ↑ "Listed buildings". Guardian Unlimited. Retrieved 6 July 2008. ↑ "Windfarms top list of UK eyesores". BBC News. 13 November 2003. Retrieved 29 November 2006. ↑ Walker, Jonathan. "New Street Station rebuild gets go-ahead". Birmingham Post. Retrieved 17 February 2013. ↑ "Video feature: new look for Birmingham New Street 27 March 2013". Railway Technology.Com. Retrieved 16 November 2013. ↑ "New Street Station Compulsory Purchase Order". Birmingham City Council. Retrieved 17 February 2013. ↑ "Rail Air Rights Towers Planned For Birmingham". Skyscrapernews.com. 2006. Retrieved 26 July 2006. ↑ "Delivering a sustainable railway - White Paper CM7176". Department for Transport. 24 July 2007. ↑ Walker, Jonathan (12 February 2008). "New Street Station rebuild gets go-ahead". Birmingham Post. Retrieved 12 February 2008. ↑ Schaps, Karolin (18 February 2008). "Six architects vie for Birmingham New Street station". Building. London. Retrieved 6 July 2008. ↑ "Transforming New Street Station". Network Rail / Birmingham City Council / Advantage West Midlands / Centro. Retrieved 3 October 2008. ↑ "MPs criticise New Street revamp". BBC News. 21 July 2008. Retrieved 7 August 2008. ↑ Re-New Street: Change at New Street Archived 18 December 2005 at the Wayback Machine. ↑ Elkes, Neil (24 August 2009). "Twin towers plan for New Street station shelved". Birmingham Mail. ↑ "Grand Central". New Street: New Start. Retrieved 19 May 2013. ↑ "Birmingham New Street work to start this year". RailNews. 5 February 2010. ↑ "Birmingham New Street station: Concourse opened". BBC News. 28 April 2013. Retrieved 19 May 2013. ↑ "Birmingham New Street station officially reopens". BBC News. Retrieved 26 September 2015. 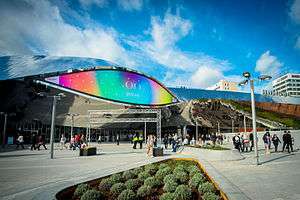 ↑ "Grand Central opening: Pictures from Birmingham's newest retail centre". BBC News. Retrieved 26 September 2015. ↑ "Birmingham Grand Central roof tiles blow off in storm - BBC News". BBC Online. 30 December 2015. Retrieved 30 December 2015. ↑ "Commercial information" (PDF). Complete National Rail Timetable. London: Network Rail. May 2013. p. 43. Retrieved 5 June 2013. ↑ "The first half of the new concourse at Birmingham New Street station will open on 28 April 2013". Network Rail. Retrieved 2 November 2013. ↑ "Walkit.com - Birmingham New Street to Birmingham Snow Hill". Walkit.com. Retrieved 4 December 2014. ↑ "Midland Metro Grand Central extension will open Monday 30th May". British Trams Online. ↑ Walker, Jonathan (16 February 2012). "£128m Birmingham Midland Metro extension from Snow Hill Station to New Street Station set to create 1,300 jobs gets go-ahead". Birmingham Mail. Retrieved 12 February 2013. ↑ "Birmingham City Centre Extension and Fleet Replacement". 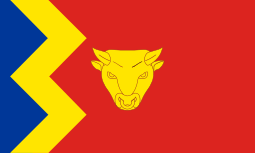 Centro. Archived from the original on 1 March 2013. Retrieved 12 February 2013. ↑ "Network West Midlands timetable". Network West Midlands. Retrieved 2 June 2016.